Best Anti-Bark Device of 2019: Do NOT Buy Before Reading This! Do noisy dog barks give you migraines? Well then, it's time to put a stop to it by getting the best anti-bark device on the market! Additionally, this tool also takes dog training to the next level. Imagine the fun of training a dog minus some of the annoying barking. Pretty cool, right? How Do Anti-Bark Devices Work? Contrary to how previous inventions were, modern anti-barking devices aren't harmful to dogs. In fact, these tools allow dogs to calm down and hold back barks. This is in response to the negative ultrasonic sound of the device that only dogs can hear. Furthermore, it is within our knowledge that there is a continuous debate going on with the pro and against anti-bark device in the dog-parenting community. However, taking sides is not what truly matters but how thoughtfully you use it for your dog's well-being and happiness. The anti-bark device has many variations. And like any other device or gadgets, it's important to buy tested and certified devices only. 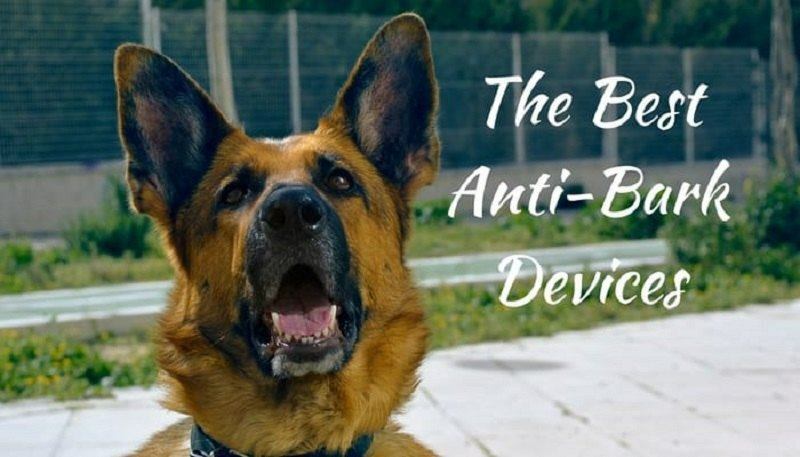 If you're looking for a high-quality and effective anti-bark device, then it's your lucky day for not only I will discuss, at great length, the importance of using an anti-bark device correctly, but I will introduce you to 10 of the safest and most efficient devices on the market as well. Yes, an anti-bark device helps stop your dog from barking continuously. But before you decide to get one, you need to know first how to use it efficiently. Only then can you consider and weigh these tools based on a number of factors such as stimulus type, safety standards, setting, and size. The DogRook Humane Anti-Bark Training Collar is not the least bit harmful to dogs as it works to reduce barking as a healthy training exercise. This anti-bark collar comes with seven vibration levels to train your pet to bark less often and less aggressively. It has sensors that activate an appropriate correction response based on your dog's bark intensity. But, rest assured, it always starts with the lowest correction setting, so it doesn't startle or intimidate your dog. However, it is best to keep in mind that this control collar was designed to help dogs that are suffering from neurotic barking disorders. It is not advisable to use it to curb the only way your dog communicates with you. For example, if your dog has the habit of barking at birds for hours, then it's time to talk to your vet about using a control collar. However, if your dog barks like how a normal dog would, then there is nothing to be worried about. There are times when dogs feel threatened by strangers, passing vehicles, or even objects and helping your dog stay calm in such situations is necessary. If you think you've exhausted all other dog training techniques, then opting to use this device as the last resort is forgivable. Moreover, this collar's adjustable nylon strap doesn't feel itchy or leave any mark on your furry pet. Lastly, this device also powered by two 6V 4LR44 Alkaline batteries, which come with the package. The manufacturer also advises to not leave the collar on your dog for more than 8-12 hours to prevent pressure necrosis. This device is the next best thing not just for your dog but for you as well. Your dog won't be subjected to any pain, discomfort, or even itch. If you prefer a no-shock and no-citron spray collar for your pet, then this collar is the right choice for you. This device, however, is not recommended for small dogs of six months and older, especially those who weigh over 10 lbs. Additionally, this collar can have reduced effectiveness for large, hairy, and old dogs. At 4 x 2.5 x 7 inches, this handheld anti-bark device works like a dream. It comes with a wrist strap that is adjustable for the most comfortable fit and operates on 4 AAA batteries, allowing you to use it anywhere you want. Now, we know that dogs often express unusual behavior by barking at strangers or other pets outdoor. However, you need not worry about this when you're taking your dog out for a walk for this tool was designed to work up to 15 feet away effectively. 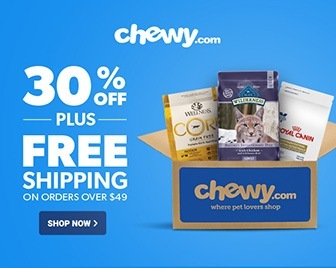 More importantly, this product makes use of harm-free ultrasonic sound that only your dog can hear, so nothing about this tool is unsafe and acute. If your dog shows sign of suffering a chronic barking problem, then it's probably the best time to consult a professional about this tool. It is not healthy for a dog to be barking all the time at everybody in his or her path. So, in hindsight, this device is not just for the well-being of your dog but for your peace of mind and other people's safety as well. Is your hyper and excited dog stressing you out every time you take him or her out for a walk? This handheld bark-control device can make it easy. It comes with an adjustable strap for the wrist and an ergonomic activation button for better accessibility. The device, however, shows poor sound effectiveness for adult dogs. There is a possibility that your older dog may get used to it, and just choose to avoid it completely. The Hoont Electronic Handheld Dog Repeller and Trainer is a stable pocket-sized dog-training companion. It emits a high-pitched ultrasonic sound that irritates dogs, effectively stopping them from barking. However, rest assured that it is harmless and painless both for you and your dog. This device also helps deter undesirable behaviors such as excessive barking, furniture chewing, constant digging, and unnecessary jumping. It's 100% pet-friendly and safe for humans. At 4 x 2 inches, this tool is among the most compact handheld anti-bark devices. However, do not be fooled by it's size for its effective range runs up to 50 feet! Yes, it threatens and repels other dogs within that range, keeping your dog from engaging in a dog fight or chase. It is powered by 9V alkaline battery and conveniently comes with battery indicator, which also functions as an LED flashlight. The guessing game of whether the battery is drained or not is already a thing of the past for this tool. The device takes less than 10 seconds to have an impact. If I were to be precise, it only takes about 5-7 seconds for it to stop your dog from barking. This device, however, requires a high-power battery which does not come with the package. Not to mention, 9V batteries are difficult to find. You won't meet a smarter birdhouse than this! The DOGTEK Sonic Bird House comes with expert anti-bark features. Including bark sensors, loudspeaker, and sensitivity settings. It dictates the barking level to activate an appropriate response. It's the best anti-bark device for outdoor use. You can place it near the main door or in your backyard. And it works using 6 standard AA batteries, which aren't included in the package. The thing to look forward to most about this device is its ease of use. It's waterproof and weather-sealed for 24x7 outdoor use. But if you'd like to have this indoor, preferably in your living room, that works too! There are 3 bark sensors on this model with 4 sensitivity settings. So it reaches any dog within range, that is if you have many dogs. Considering its big size, it runs for longer than 8 hours without missing even a single second of sensing. The LED light configuration lets you know if it's working, which is great for a good night's rest. Placing this birdhouse isn't a problem at all. You can install it 8-10 feet off the ground with a 30-50 feet clearing. The detection range on this device is strong and effective. But you can adjust it based on your placement preferences. Triggering the sensors and activating the ultrasonic sound is easy enough. But the responsiveness on this model isn't as effective as it can be. This means you need a smaller, portable device to train your pup from barking excessively. The PetSafe Vibration Bark Control Collar uses vibration technology or stimulation. It helps reduce or stop excessive barking for dogs with a long-term problem. It features a patented and certified bark detector. Which differentiates other dogs barking and noises. So there isn't any false detection, this waterproof device is ideal for dogs over 8 pounds. It can be submerged in water down to 5 feet. Making it the most durable and reliable anti-bark device on the market. Unlike shock collars, this best anti-bark device uses vibration to correct barking. It automatically starts at the lowest level of vibration. The intensity of vibration level increases if the barking persists. This vibration collar offers 10 distinctive levels of intensity. For energy efficiency, this model also features an automatic shut-off feature. This feature shuts off after 80 seconds for safety. This collar is a clever training tool for lots of reasons. And you can use it in versatile ways too! For example, it takes a while for your dog to connect the dots. 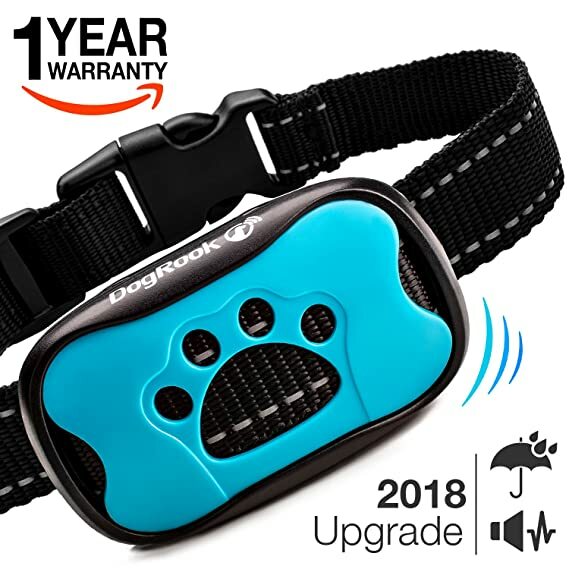 Training your dog once or twice a week with this collar is a good way for him to relate his barking with the vibration. This way, he'll know when to immediately stop barking in inappropriate conditions. Is your dog smarter than you think and ignores the vibration? Try using the collar once or twice in a couple of weeks. Giving him breaks from this exercise will force your dog to respond. That will make your dog relate a negative stimulus to barking uncontrollably. This model lacks vibration level control in case you want to stick to the lowest setting. It's all automated based on its patented bark detector. The PetSafe Outdoor Ultrasonic Bark Deterrent is an easy-to-setup anti-bark device. It comes in a classic birdhouse design joined with sound sensors. It uses high-pitched ultrasonic sound to deter excessive barking. Especially good for dogs with neurotic barking disorders. Perfect for outdoor use, this best anti-bark device works within 50 feet of hearing range. You can mount it in your backyard to stop your dog from barking continuously. Dogs communicate only through their barking, but excessive barking is a symptom. One your dog's endless barking cycle begins, it's difficult to get him to stop. Only this reliable device can help him recover. The weather-proof, durable unit keeps going for as long as you want. Powered by 9v batteries, you can set the best possible timing when your dog plays around outdoors. So let the device handle the rest. You don't need to train your dog with a collar if you want something less controversial. This ultrasonic bark deterrent is a good way to keep your dog calm and happy when playing outdoors. He can play fetch, chase squirrels, race his own shadow across the floor, or stare at birds. But nothing will force him to bark aggressively and rouse neighbors' dogs. This device has a way to determine different types of barking in a few seconds. All thanks to its sensible bark detector. It understands when the bark is playful, warning, or alarming. So this will help correct unwanted barking behavior as a good training aid. The battery holder only supports 9v batteries which are hard to get nearby. You might have to pick up in stock when you finally tackle a shop that sells 9v batteries. This might cost you a few extra bucks. The HappyHomey Ultrasonic is everything you need for your home. It's super safe, comfortable, and durable. You can complete your dog training aid with this best anti-bark device. It uses high-toned ultrasonic sound to deter barking. The portable and lightweight unit can be installed on a tree, fence, or a wall. Plus, the well-designed birdhouse shape doesn't look at all suspicious. If you want, you can place it on your front porch and take it indoors at different times. The performance of this device is very effective and harmless. It deters barking immediately, so you and your dog can relax in a stressful situation. That said, you will notice a huge difference in your dog's behavior in less than 2 weeks. The clean, durable plastic unit it comes in holds plenty of space for hanging. It has plenty of grip and space for mounting on trees or fences. So portability is not a matter of concern for you. Dogs bark when the doorbell rings or see feel threatened by some unusual object. This way of communication is considered healthy for dogs. But if your dog barks in an endless cycle, for hours even, you need this. Such devices are behaviorally activated, which means they correct behavior by deterring barking. This device controls the amount of stimulation based on the barking intensity. Surprised by the sound, your dog will associate barking with the negative stimulus. You might find that your dog is getting used to the high-pitched tones of this device very quickly. So this device may not be as effective for bigger and stubborn dogs. The PetSafe Indoor Ultrasonic Bark Control is yet another ultrasonic device. But more portable and compact than the rest. It features an internal microphone and a LED light battery indicator. This is the ultimate bark control for single dog homes. If you're finding it hard to calm your dog down at the end of the day, try this. It works through 25 feet of hearing range. In fact, it can exceed that range depending upon your dog's attention span. You can mount this best anti-bark device 10 feet high if you want. This will amplify the effectiveness of the device. Within 2 weeks of training, you can notice an immediate change in behavior. I would go on record to say that this is the best device for indoor use only. It boasts good value and makes for an excellent addition to your home. Especially when you're new to training your dog from barking excessively. Once the device detects barking, it flashes a red light sensor. So you will know when the device needs a battery change for continuous performance. Female dogs are far more stubborn to train, research suggests. Plus, they have a more high-pitched barking sound. So calming a female dog down might be difficult. Hence, keeping this device closer in terms of hearing range is ideal. The only downside to this model is that it doesn't come with a power button. Which means once you put the batteries, it keeps on running regardless of the need of correction. The PetsNall Portable Electronic Dog Trainer is a good training aid for beginners. It's harmless, pet-friendly, and portable. Nothing is worse than approaching an aggressive or barking dog. Especially if the dog isn't yours. Having this electronic dog trainer by your side to deal with strange dogs is wise. On the other hand, you can use it to train your own pet a few methods to stay calm. This also includes behavior correction. This model comes with a steady LED flashlight, which doubles as a battery indicator. So if you stay in remote corners, you'll never run out of support of this handheld device. It has the effectiveness of reaching 50 feet to deter aggressive dogs. So it's a good protection device for stray dogs. All the while, it remains harmless and painless to dogs and humans. Consider it a distraction device to stay out of harm. Moving forward, it has an audible alarm that's clear and sharp. There's no way a dog won't be able to notice the high-pitched noise. For training, your dog will soon be able to differentiate between a negative stimulus. This will compel him to stop barking immediately. It also helps when your dog is keen on chewing on furniture or your belongings. The PetsNall is portable and handy! It runs on 9v batteries and with a simple touch of the button, you can activate the alarm. It is audible and ergonomic, thus ideal for dogs with excessive barking problems. The battery life is quick to run out on this device. So keeping a few spare batteries, in your bag, is recommended. Tested and certified by professional trainers, you won't have a problem with this one. It is The Company Of Animals Pet Corrector. It is chemical-free, pain-free, and pet-friendly. It is a complete behavior corrector to reduce barking as well as unwanted chewing. The only way to use this is to spray it close to your dog to discourage excessive barking. There is no presence of gas or chemicals inside this device. It contains odor-less compressed gas. Which is safe to use around animals, including dogs. This best anti-bark device is good for dogs who are intensely motivated and excited. And it's ideal for small and big dogs. This pet corrector does wonders for dogs with behavioral problems. And it calms down highly-energetic pups too. Sometimes, when your dog is introduced to a new environment, things might get out of hand. So helping him adjust to his new habitat before using this device is advisable. Using this device only after consulting with a dog trainer can help you make the most of it. You'll understand the right technique to use and how often. It's all the matter of how you use an anti-bark device that makes a difference. And this device is a good deal to place your bets on. You won't notice a difference in behavior all the quickly. You must remain patient with your training exercise. This is also to make sure your dog understands you and is able to communicate more proficiently. However, for more aggressive behavioral correction, this pet corrector remains ineffective. It works fine for dogs with a minor barking problem. But for more serious disorders that involve barking, you might not like this one. Choosing an anti-bark device for your dog might confuse and terrify you. There is plenty of chatter in the dog-owning community about using an anti-bark device. Some argue for its safety, while some argue against it. But are they humane and safe for dogs? The first step you need to take when choosing an anti-bark device is to choose a certified one. Nothing is worse than picking up the first device you see on the shelves. It's irresponsible and reckless. Finding a well-reviewed, tested, anda certified device is essential. The purpose of buying an anti-bark device is to find a solution for a chronic barking problem. If you're buying one because your dog barks, as dogs do, then you definitely do not need an anti-bark device. You need a device if you consider your dog to be barking excessively for long periods of time. Do not consider buying if your dog barks when a stranger is around. Or when there's a bird sitting on the tree outside your window. Those are ways your dog tries to communicate with you and hindering that aspect of his life is not healthy! That said, the second thing to work on when using an anti-bark device is to use one thoughtfully. This means knowing how to use anti-bark device as per the safety standards, and not your convenience. Using such an extensive training tool requires scheduling and maintenance. You cannot use an anti-bark device on a daily basis as a training exercise. You want your dog to make it a habit to not bark excessively. This needs time, effort, and understanding on both ends. If you're still unsure about using an anti-bark device for the first time, consult a professional. They will help you stay gentle and thoughtful when using a certified anti-bark device. A remote sound emitter can be placed anywhere indoors or outdoors. It discourages barking with the help of sound waves that are only audible to dogs. The ultrasonic technology releases sound waves that any dog would find unpleasant. And that makes them immediately stop barking to avoid that negative response. Once you do this, your dog will relate barking excessively to an unpleasant response. There are two types of ultrasonic sound emitters for stopping barking. You can buy a stand-alone device or a collar. Most people prefer using a stand-alone device kept a few feet away from the dog. This is a good way to train your dog to stay calm in situations that excite him. There are limitations to using a sound emitter. For one, your dog might be able to ignore the unpleasant sound and continue barking. So buying a sound emitter depends on the way your dog responds to external stimulus. Personally, I wouldn't advise buying an anti-bark shock collar. But for treating an aggressive barking condition, they might be helpful. According to my research, shock collars are the least effective of them all. And they are also least humane and safe, to begin with. Using one under professional supervision is ideal, but not without. So if you're opting for a shock collar, it's better to let a professional trainer use it than you. An anti-bark collar uses a small jolt of electric shock as the negative stimulus. This response takes your dog by surprise, compelling him to stop barking immediately. So each time your dog thinks of barking, that unpleasant response etched in his mind stops him from doing so. As opposed to sound and shock, a citronella spray can also be used to restrict excessive barking. Dogs dislike citronella's scent and flavor as we do garlic's or onion's. And finding it unpleasant, dogs may associate it with a negative response. If your dog starts barking excessively, spray some citronella into the air. The scent and taste of it might take him by surprise, forcing him to stop barking immediately. According to my research, citronella isn't harmful to dogs. You can compare the effects of garlic to citronella. Only that we, as humans, find garlic an unpleasant food to smell or consume as it is. 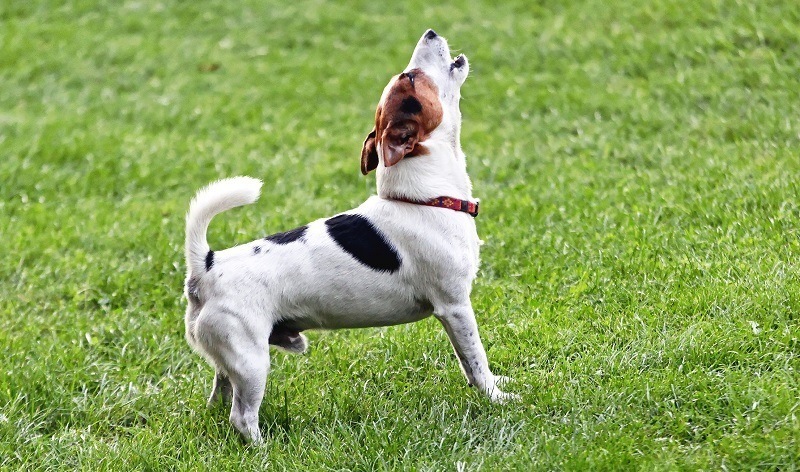 Is your dog barking all the time? It’s wise to consult a professional before opting for an anti-bark device. Keep buying such a device as your last resort, with your doctor’s consent, to stop excessive barking. Unless a professional gives you the go-ahead for using an anti-bark device, do not indulge in one. There are plenty of reasons to NOT USE AN ANTI-BARK DEVICE. So it's safe to understand the application of one before using it on your dog. With conscious effort, here's the safest and most effectual anti-bark device to use. It’s the First Alert Bark Genie that works on all breeds, is safe, and durable. It operates on standard batteries that can be bought anywhere. It’s the best anti-bark device for deterring barking and curbing the unhealthy behavior. 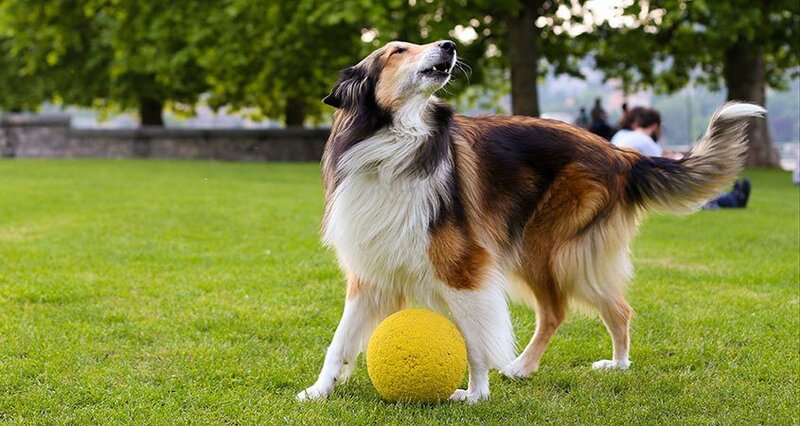 DogRook Vibrating Bark Control Collar works to reduce barking as a healthy training exercise. Dog owners can use this, giving the correct stimuli at the ideal time. It comes with an adjustable strap setting. While the battery life is effective and very durable. Hello Ruby. Great work you put in this article, it’s highly commendable. The fact that you made it quite clear that not all barking from dogs deserves the anti bark treatment is wonderful. Worthy of note too is that some dogs may not be responsive to these devices because of so many factors including but not limited to hearing impaired dogs et.c. Even though our device is missing from your review, no hard feelings yeah? We will keep visiting your site for more quality reads.